A Red Flag Warning has been issued for Tuesday, Febrary 27, 2017 from 11:00am to 6:00pm. 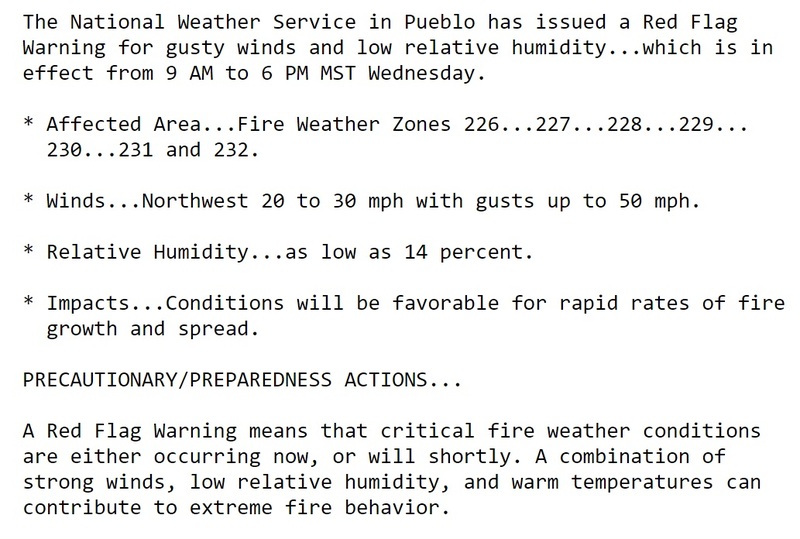 Low humidity and strong winds will combine for increase fire danger. Use extreme caution with potential ignition sources, dispose of all smoking materials in appropriate containers, and report new fire starts immediately. This entry was posted in Uncategorized on February 27, 2017 by tstoeckl. Another Red Flag Warning has been issued for Thursday, February 23, 2017 from 11:00am to 6:00pm. Continue to be cautious with potential ignition sources, and report new fire starts immediately. This entry was posted in Uncategorized on February 22, 2017 by tstoeckl. 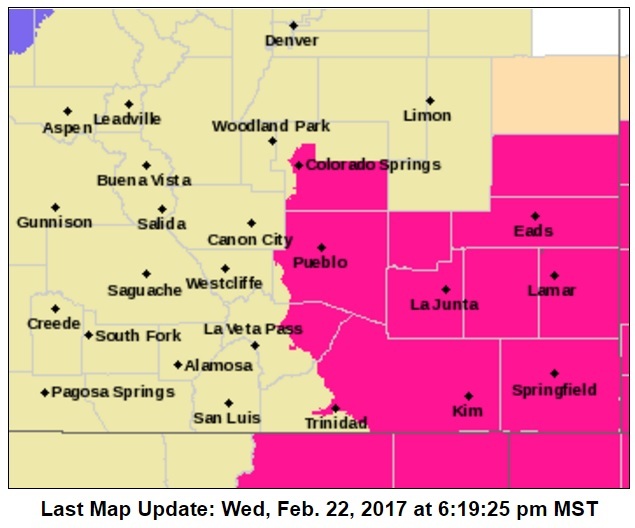 A Red Flag Warning has been issued for Wednesday, February 22, 2017 from 11:00am to 6:00pm. 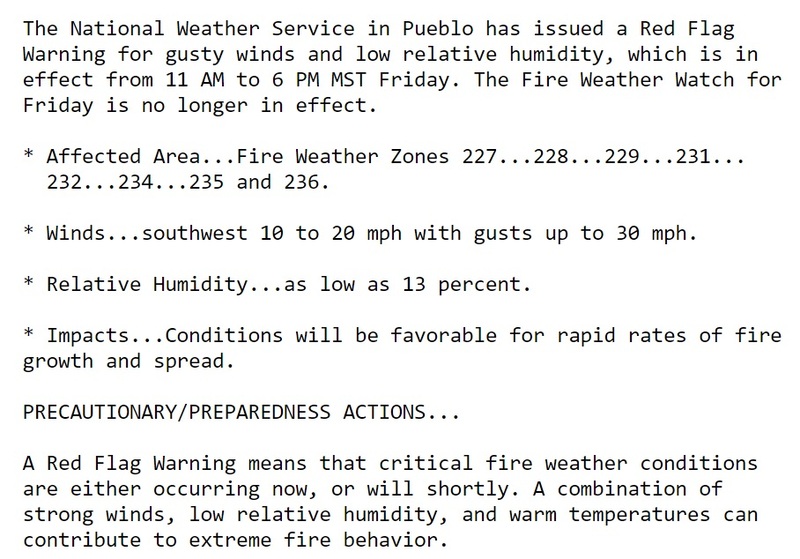 Low humidity and strong winds will combine for increase fire danger. Use extreme caution with potential ignition sources, dispose of all smoking materials in appropriate containers, and report new fire starts immediately. This entry was posted in Uncategorized on February 21, 2017 by tstoeckl. 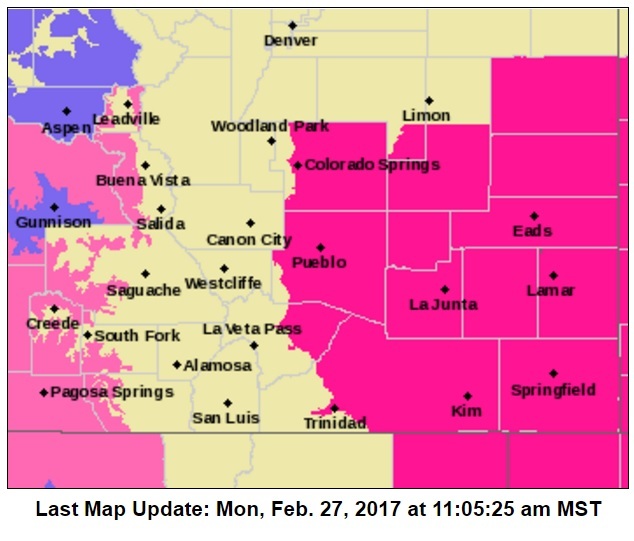 A Red Flag Warning has been issued for Tuesday February 21, 2017 from 11:00am to 6:00pm. Use extreme caution with potential ignition sources, dispose of smoking materials in appropriate containers, and report new fire starts immediately by calling 911. Designated classroom, assembly area, and customer service desks WILL receive a call to test their functionality of using voice alerts. The caller ID should read “UCCS Police”. While this may cause a very brief interruption, particularly in the classroom settings, we want to emphasize the importance of testing these capabilities during non-emergent times. If there is a “real” emergency, or other potential need to send an alert on Friday, the test will be postponed to the following Friday. If you have questions or concerns regarding today’s test, your registration information, or the emergency notification system in general, contact Tim Stoecklein, Program Director of Emergency Management, via email at tstoeckl@uccs.edu, or via phone at 719.255.3106. This entry was posted in Uncategorized on February 10, 2017 by tstoeckl. A Red Flag Warning has been issued for Friday, February 10, 2017 from 11:00am to 6:00pm. Use extreme caution with potential ignition sources, dispose of smoking materials in appropriate containers, and report new fire starts immediately. This entry was posted in Uncategorized on February 9, 2017 by tstoeckl. If there is a “real” emergency, or other potential need to send an alert on Friday, the test will be postponed to the following Friday. If you have questions or concerns regarding Friday’s test, your registration information, or the emergency notification system in general, contact Tim Stoecklein, Program Director of Emergency Management, via email at tstoeckl@uccs.edu, or via phone at 719.255.3106. This entry was posted in Uncategorized on February 7, 2017 by tstoeckl. 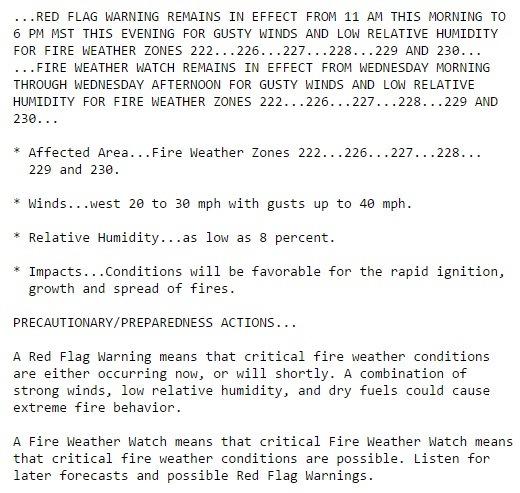 A Red Flag Warning has been issued 9:00am-6:00pm on Wednesday for increased fire danger due to forecast gusty winds and low humidity. Use extreme caution with potential ignition sources tomorrow, and report any fire starts immediately by calling 911. 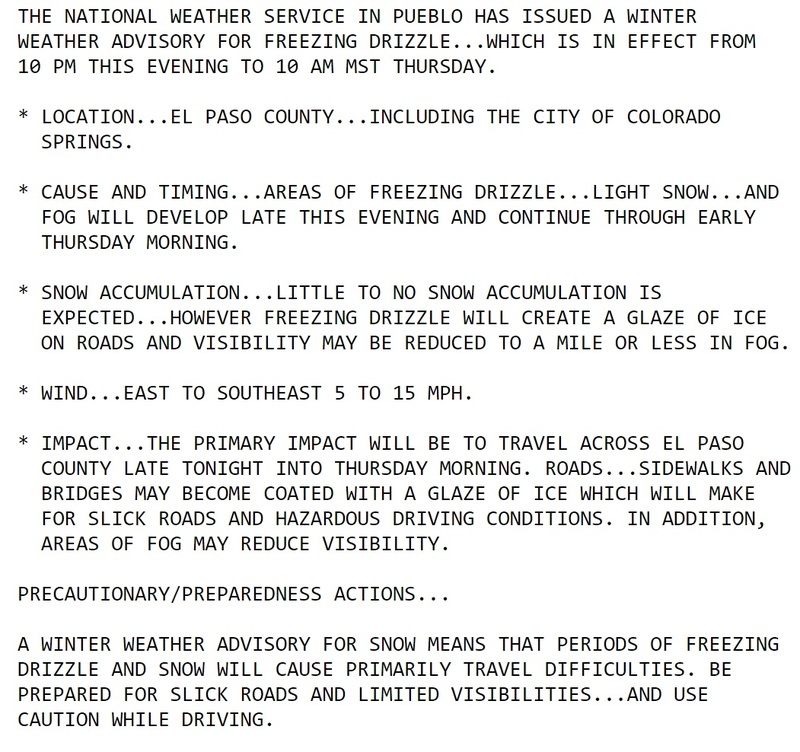 A Winter Weather Advisory has been issued from 10:00pm tonight tp 10:00am Thursday. Light snow and freezing drizzle may cause surfaces to become slick, including roadways. This entry was posted in Uncategorized on February 1, 2017 by tstoeckl.